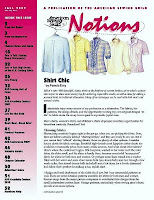 I was honored to be asked to write the cover article for the Fall 2009 edition of the American Sewing Guild's Magazine. Titled "Shirt Chic", the article includes my take on Choosing Fabrics, Fine-Tuning Construction, and Adding Designer Details. Well...so far, so slow. 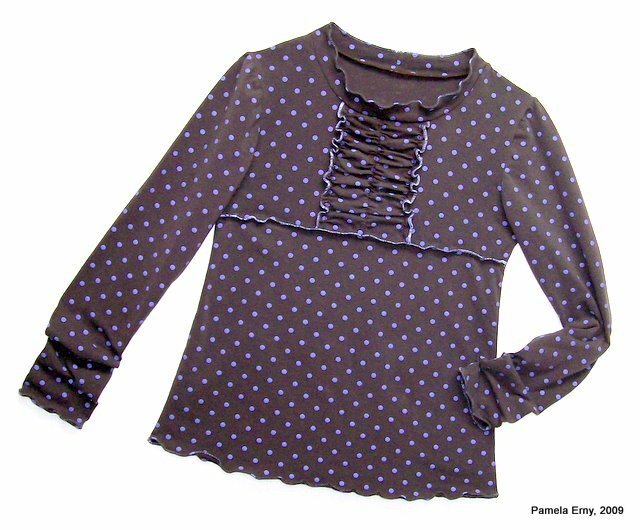 The good news is that a shirt pattern is a shirt pattern is a shirt pattern. 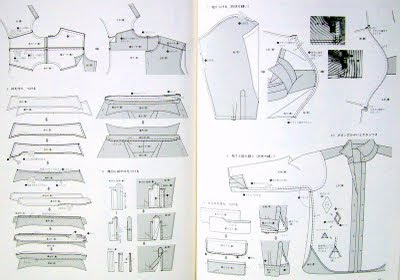 What I mean is that I am very familiar with shirt pattern "parts"...there isn't much I haven't seen after sewing hundreds of shirts I've either drafted from scratch or used patterns to make. 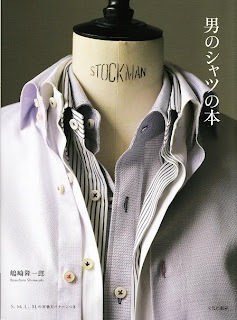 The slow part is familiarizing myself with the methodology of this Japanese Shirtmaking book with no English translation. Specifically, how these pattern pieces are drafted and how the seam allowance margins are allocated. Because not all the seam allowances are the same width. This is a very good thing, and a sign of sophisticated drafting. It saves time to have all the pieces fit together and not need trimming after the seams are sewn...it also saves fabric, always a good thing. On the other hand, these patterns allocate allowances a bit differently than I do when I hand-draft a pattern. And since I want to give a fair review of these patterns, I'll cut the pieces their way...I am always open and eager to learn something new. So, This weekend I hope to get the pattern pieces traced and walked...but only after I've given my studio a good tidying up. and winging its way to him by Priority Mail ! I'd like to mention a few things about some of the details of this shirt. 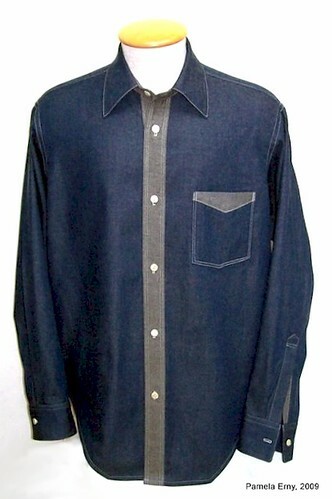 In previous posts, I was undecided about how to best use the contrast side of the denim. As you can see, I ended up using the contrast for both of the front button plackets, the top of the pocket and both sides of the collar stand (band). I decided to add a contrast detail to the sleeve, but I wanted it to be very subtle. So I made a 2-piece sleeve placket and used the contrast side of the fabric for the under-lap. You can see it peeking out of the unbuttoned cuff in this photo I hastily snapped just before the shirt was packed and sent on its way. Oh...one more thing...if you notice that one sleeve appears longer than the other, it is because it was pulled forward for the photo. Many of my clients remark that the collars of the shirts I design are very comfortable and that they don't have to fuss with them. 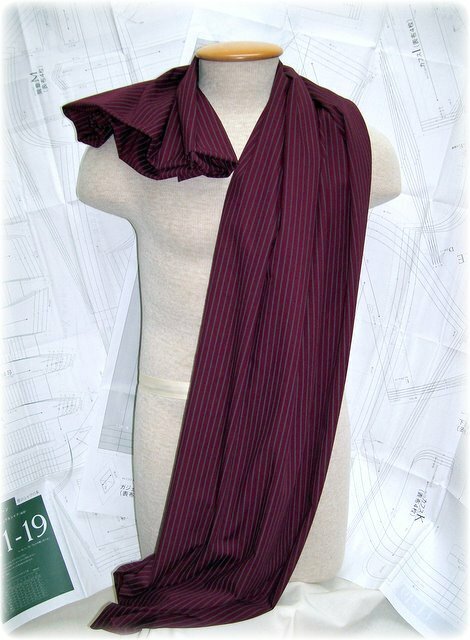 That's because I specifically design shirt collars to follow the natural curves of the neck and shoulder. 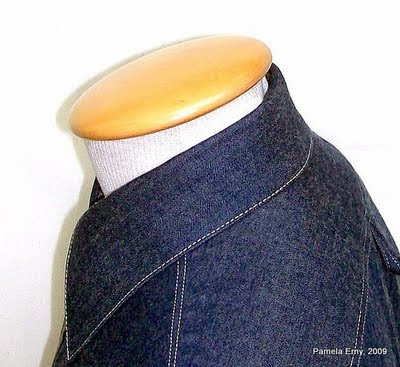 Take a close look at the collar on the denim shirt I am currently making, shown below. Most (if not all) commercial shirt patterns have collars with top edges that are just straight across or that have one long slight curve. However, as you can see...I have drafted my collar pattern with curves that follow the natural shape of the body. SEWING NOTE-This collar has been interfaced with Pro-Weft Fusible Interfacing from ~Fashion Sewing Supply~. then again below as the full draft. Note that the bottom edge of each pattern shown is the neck edge, and that the pattern has been drafted with 3/8" seam allowances. It has been placed on a 1-inch square grid so that you can see the scale. You are welcome to copy the pattern...however if you use my draft and post a photo of a shirt made with it, please link back to this post, and/or reference it. Thank-you...and I hope that you enjoy using this draft ! I've been asked about the collar stand (band) pattern that I usually use with the collar draft I showed above. Almost any stand can be used with this collar, as long as you draft the collar wide enough to cover the width of the stand (band). So, here it is...you will notice it is fairly standard. 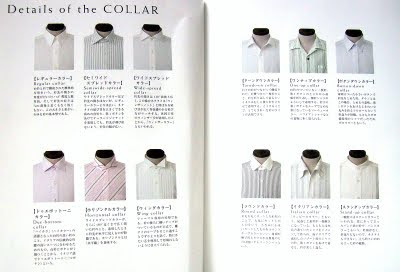 It really is the refined shape of the collar (shown above) that allows it to fall so elegantly.